Lara Bars are my favorite bring along bar. You know what I mean by that, as all of us with a dietary restriction will often carry an emergency food item ... just in case! For me, that is the LaraBar. I would not really look to this as a granola bar replacement. To me, this is more of a dessert/sweet treat. Still there are times when I am glad we have a bar on hand due to our allergies to dairy and gluten. One thing I have discovered about these date sweetened delights is that everyone seems to have a different review! Some love them, some hate them, some adore one flavor, while the next person cannot tolerate the same flavor. The Cocoa Mole is my new favorite. It is a great replacement for a chocolate craving, and with the cocoa powder, a nice antioxidant boost. The bar has 4g of protein, 5g of fiber and a whopping 21g of sugar from dates! Wow that is a lot of sugar (even if it is fruit sugar). As I said, this is what I eat instead of grabbing a cookie, or candy bar when I am out and about. It's also my go to when I'm really feeling the need for chocolate! The Peanut Butter bar tastes just like a peanut butter cookie, to me. I Adore the Lemon, as it is the fizzy lemon meringue pie taste I have not had in years. Cherry Almond is another top choice that I never tire of, for what's not to like about cherries and almonds? I even like the Apple Pie with it's strong cinnamon and pie spice flavor, and the coconut which is very...coconut! I am not, however, a fan of the chocolate coconut or the jocolat mint chocolate. This is where the individual preference comes in because those are my daughter's favorites! She could eat the mint chocolate daily, and she avoids all the ones I listed above, like the plague. So, I guess you'll just have to try some for yourself and see what you like. Let us know! The texture of these bars are firm, yet soft (due to the ground up dates). The nuts are not broken down, entirely, so there are chunks to chew through here and there. So, if you are looking for a travelling treat that delivers to your sweet tooth, yet still carries it's weight in nutrients, I can recommend Lara Bar. I look forward to trying the newer Crisp bars, which are signifigantly lower in sugars! 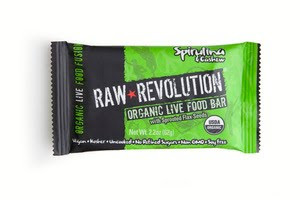 If you are looking for more of a health food bar, take a glance at Raw Revolution bars. They have an impressing ingredient listing such as spirulina seaweed powder and sprouted flax in additon to a nice balance of fiber, protein, and sugars. Reminder: When you're eating compressed food bars, don't forget to stay hydrated! Drink your water.